Facebook is coming out with something new. Right on the heels of bringing forth a great change to its “Like” button, Facebook is back in the news with another introduction: the Live feature. With this new feature comes the ability to live stream a video across Facebook which can be seen by all your friends. Although Facebook first rolled out the feature in the December of last year to a few verified accounts and celebrities, it’s prepping for a wider rollout in the first quarter of this year. That means Facebook Live might soon be coming to your smartphone too. Here’s how it works. You can start off a Live video through the “What’s on your mind?” box at the top of your News Feed. The video will appear right on top of your friends’ News Feed if they are to log in while you are streaming. Once you are finished, the video will be automatically saved on your timeline. Pushing Live videos to the top of the News Feed is only one example that demonstrates how serious Facebook is about promoting the feature. The company is also trying to recruit celebrities to broadcast themselves through the service. Facebook’s senior executives have been in talks with major talent agencies to this end. For their efforts, Facebook will be offering a monetary reward, the first of its kind for the internet giant. This monetary reward may be signs of things to come. Although as of its launch, there are no ads shown on Live videos, it doesn’t mean that the option doesn’t exist. 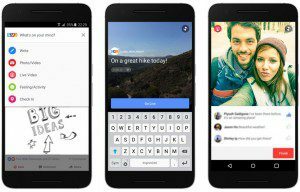 Facebook’s strong push for Live could be an acceptance of this potential. And Facebook might not be too far off with this potential, since their own records indicate that people will watch Live videos almost three times longer than the saved versions. This is further supported by the success of similar apps like Meerkat and Twitter’s Periscope. There have been interesting trends in the wake since observers are noting that Facebook could also be looking to create an ad-revenue sharing system like YouTube has going on for its content creators. If you are a business who interacts and connects with your clients through Facebook, and would like to know more about how Facebook’s latest feature affects your business, we at GMI can help you out. Get in touch with GMI to optimize your business’ reachability and connections over social media. Twitter – It’s all about Moments now!